"There's nothing wrong with giving homemade holiday gifts, just as long as they're something somebody would actually want and use. Thanks to things like fruitcakes so dense they have their own gravitational fields, making edible gifts has gotten a bad name, but that's not an issue with this chipotle oil, especially if that certain someone on your gift list likes the spicy stuff!" Heat oil over medium heat in a saucepan until it reaches 165 degrees F (74 degrees C). Pour ground chipotle peppers into a heatproof bowl. Pour oil over chipotle; whisk until chipotle is dissolved. Cover bowl with aluminum foil and seal tightly. Leave for a week, stirring once per day. Pour chipotle oil through a fine mesh strainer into a bottle or glass container. 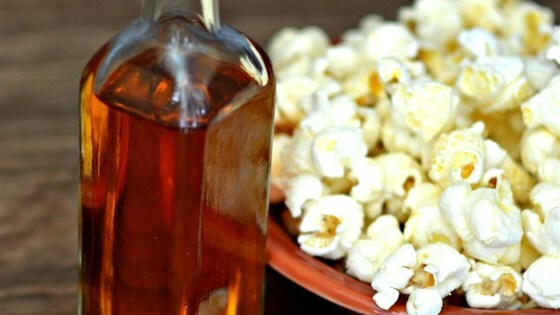 Make beautiful homemade chipotle oil to give as holiday gifts.